This year’s Dynamic Communities Summit, held in Phoenix, AZ, drew over 7000 attendees. It was the largest conference to date, and, as a result, Microsoft was in attendance to talk to the crowd about the Digital Transformation. Now, if you are like me, you are a little tired of hearing this phrase. It tends to get used ad nauseam by Microsoft and never really seems to mean much. However, I was pleasantly surprised at the Keynote Speech, to hear James Phillips use it in a much more meaningful way. The concept of Digital Transformation is not new. Companies have been going digital and moving to the cloud for quite a few years now. More and more software is SaaS based instead of perpetual, applications are hosted in the cloud, and companies are moving away from paper-based processes. In reality, the digital transformation is happening around you and to you, whether you are ready or not. In his keynote speech, James Phillips (Microsoft)- Director of Business Applications discussed “industries in transition” as a result of digital transformation. Cloud based technology, artificial intelligence, machine learning, etc. have all effected the way organizations do business every day. Markets are saturated. Whether that be a ride sharing service, distributor of knobs and hinges, cosmetics company, or car manufacturer… there are several options for consumers across every product or service. In this environment, how do you win customers and retain them? Traditionally, we have gathered data to better understand our customers and their behaviors. When and why do they buy? What drives them? This is where “Big Data,” an old buzz term, came from. Companies were hoarding mass amounts of data about their customers and their competitors. The problem is, data is just one aspect of digital transformation. 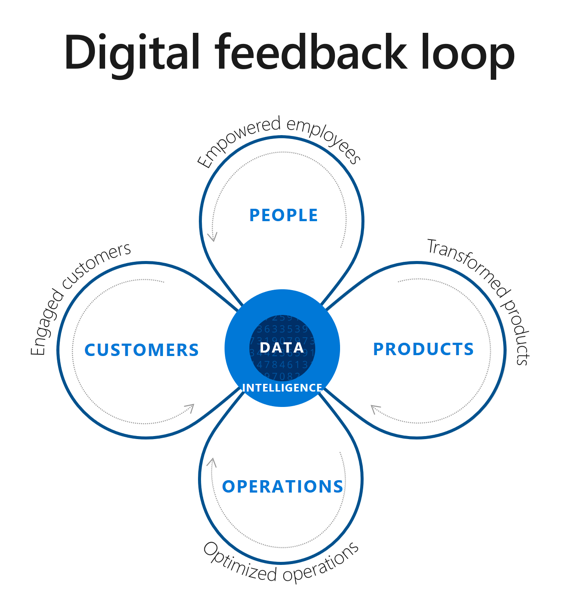 During the keynote, Phillips displayed an explanation of the digital feedback loop. You can see here that DATA is the center of the feedback loop, so it is driving everything. However, without engaged customers, empowered employees, transformed products, and optimized operations that data is meaningless. Data comes first, but alone there is no value. So how do we create value from our data? Phillips explained that we do this through Intelligence and Action. Today, companies like Polaris and Ford are using Artificial Intelligence and Machine Learning to understand their data and better serve their customers. They are completely transforming their business processes to adapt to todays’ digital age and the needs of their customer. Those are big names, but that doesn’t mean smaller businesses can’t do the same. 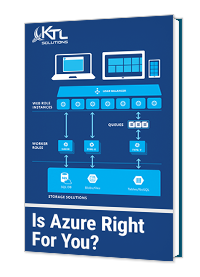 The beauty of Microsoft Business technology is that it is scalable like no other cloud company. A five-person business and Fortune 500 company have access to the same technology at a price point that works for their needs. Small or large the concept is the same for all organizations- Data + Intelligence + Action is the Digital Transformation. This all sounds great in concept, but how does a small business really achieve this? Microsoft has rolled out several new intelligence features to help customers take action on their data and transform business processes. These features are wrapped in to their flagship cloud platform, Dynamics 365 (all based on the Azure cloud). Features like market insights (to know what your customers are thinking, seeking, ad feeling) and predicative lead scoring (to take the guess work away from sales and accelerate the sales process) are always to take data, empower your employees, engage better with customers, optimize your processes, and ultimately transform your “product” accordingly. The message from Microsoft was loud and clear: It is time for industries and businesses to re-evaluate and adapt. Optimize the way you work, get in sync with your customers, empower your employees to do more, faster, and better. Take part in the Digital Transformation or get left behind. Don’t get left behind. Contact KTL Solutions today.